©FAO/Roberto Cenciarelli 20 July 2018, Rome — Improving governance of forests and lands is crucial for many countries if they are to succeed in reducing deforestation and forest degradation, meet their climate change commitments under the Paris Agreement and achieve the Sustainable Development Goals. This was a key message from today’s World Forest Week event ‘Improving governance for reducing deforestation and forest degradation – Collaboration between REDD+ and FLEGT initiatives’. Synergies at the country level between these two critically important programmes — United Nations Collaborative Programme on Reducing Emissions from Deforestation and Forest Degradation (UN-REDD) and FAO-EU Forest Law Enforcement, Governance and Trade (FLEGT) — enhance the outcomes of their work to improve governance and reduce deforestation and forest degradation. “These two FAO-supported initiatives work on different aspects of the same challenge of reducing deforestation in order to achieve the Sustainable Development Goals and other global initiatives, including achieving countries’ Nationally Determined Contributions on reducing greenhouse gases,” said Tiina Vahanen, Coordinator of FAO’s REDD+ Programme. “We also share a cross-cutting theme in our work: governance,” she added. Both UN-REDD and FAO-EU FLEGT have made strengthening governance an important part of their programme work. Invited panelists, including government officials, donors and civil society, emphasized the benefits of coordinating REDD+ and FLEGT activities at the country level, and reviewed countries’ progress in improving forest governance through legal and policy reforms, as well as the impact this work has on reducing deforestation and forest degradation. 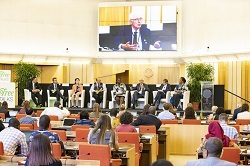 “Both UN-REDD and FAO-EU FLEGT programmes are in a unique position to work together to strengthen governance in the forest sector, clarify land tenure, facilitate stakeholder engagement, increase transparency, and halt illegal logging, replacing it with legal production and consumption of timber”, said Robert Simpson, Manager of the FAO-EU FLEGT Programme. “At the same time, these actions promote and improve local livelihoods”. This work contributes to achieving a number of Sustainable Development Goals, including sustainably managing forests and mitigating climate change, according to panelists. Furthermore, these efforts — which contribute to ensuring legal timber and legal trade in that timber— build upon the principles of good governance, good conservation and good management of forest resources. As countries work to halt and reverse forest loss and forest degradation, they are reducing their greenhouse gas emissions and achieving their Nationally Determined Contributions. The session, opened by FAO's Deputy Director-General Daniel Gustafson, included examples of successful collaborations involving the two FAO-supported programmes in Colombia and Côte d'Ivoire. Together, UN-REDD and FAO-EU FLEGT have supported the development of a timber traceability system and a community forestry programme in Colombia through the Ministry of Environment and Sustainable Development (MADS). In Côte d'Ivoire, UN-REDD and FAO-EU FLEGT programmes have jointly supported the Ministry of Water and Forests (MINEF) in implementing a Forest Code setting out laws and regulations that govern forestry in the country.